The price tag makes SmartEyeglass almost £400 cheaper than Google Glass, which has been temporarily pulled off the shelves as the search giant works out how to develop the idea further. Unlike Google Glass, which shows information through a tiny, square-shaped display, Sony's SmartEyeglass offers augmented reality lenses that superimpose information across the wearer's entire field of vision. That suggests the glasses won't be any good for prescription lenses just yet. For now, Sony said it's hoping developers will come up with new apps and use cases for the device, and has also released a software development kit for SmartEyeglass. That gives developers access to the gadget's camera, GPS, microsoft and sensors including a brightness sensor, gyro and compass. 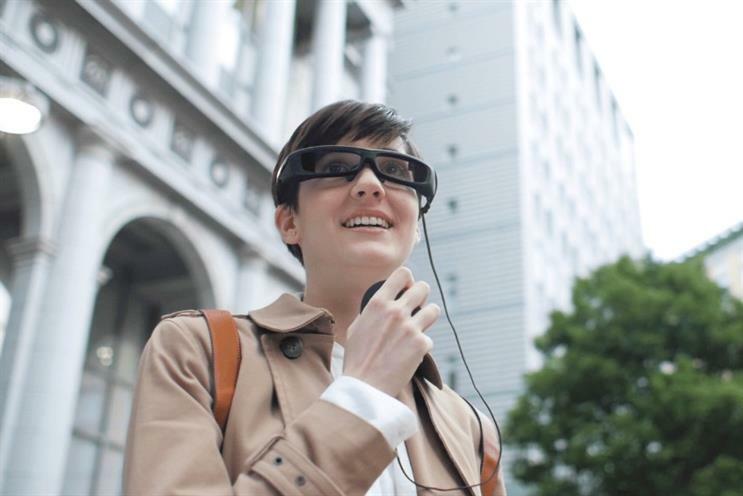 The SmartEyeglass uses holographic technology to overlay information onto the lenses. These, according to Sony, should not impair the wearer's vision too much with "85% transparency", though they probably aren't a good idea for driving. The current version of the glasses is heavier than Google Glass at 77g, versus 42g. Sony claims that text and graphics are visible in different lighting conditions, making the glasses useful in dim environments or outdoors. The glasses do not work in isolation, instead pairing with the wearer's Sony smartphone with plug-in controller. For example, where Google Glass wearers control the device by stroking the frame, SmartEyeglass wearers use a touchpad on the controller. At this stage, the set-up is clunky - the glasses look like a pair of swimming goggles, and the controller cable is an awkward extra. But Sony has envisaged hands-free use cases, largely in industrial environments such as a warehouse or factory. The SED-1 is available for pre-order today from the UK and Germany, then in eight other European countries from March. Microsoft, which recently showed off a prototype of its own HoloLens smart glasses, is on a serious hiring push to make its device a consumer reality. The company is hiring for more than 30 positions, according to job listings on LinkedIn, including data scientists, software engineers, managers and marketing managers. Like SmartEyeglass, Microsoft's HoloLens offers holographic computing, enabling the wearer to interact with virtual 3D objects. The company has only shown off a prototype to date, with no details on pricing or availability.